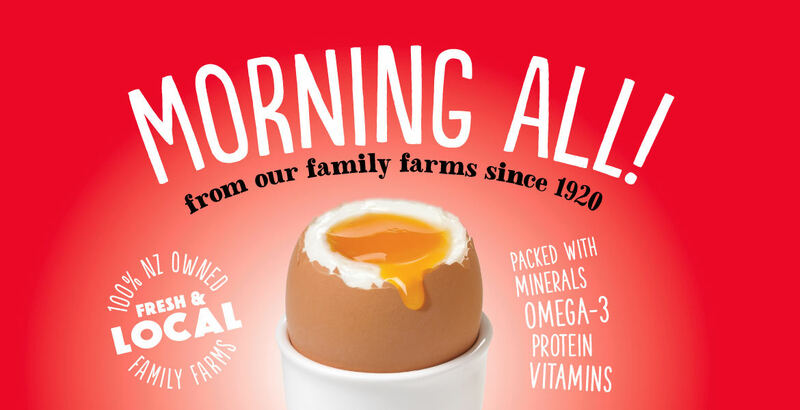 We’re committed to giving our loyal Morning Harvest customers the best range of eggs to choose from. Plus, you can be assured of the freshest and the best no matter which one you select. We are a co-operative of independent 100% New Zealand family owned and operated farms located throughout the North and South Islands of New Zealand. Our first family farm was established in the Hawkes Bay way back in 1920. Some farms have been in the same family for nearly 50 years, passing down from generation to generation, supporting local communities. It's good to know that all that knowledge and experience is being put to good use and we’re still 100% New Zealand owned. All of our Morning Harvest farmers are down to earth, friendly and hardworking. Each day we make sure our eggs are freshly gathered, graded, packed and on a truck to a store near you, for you to enjoy. You can be sure you're getting only the freshest and the best! All of our eggs are produced on a local, family owned farm. No mysterious middle men, no mass storage. Just your typical, quality Kiwi farms. If they ain’t good enough, they don’t leave the farm. All of our farms operate a strict Risk Management Programme which ensures the best quality eggs. All eggs that leave the farms are delivered directly to our customers. Fresh is best.